As you may have seen, the council voted this afternoon 12-1 in support of the full restoration of the Town Hall. I think it it’s a marvellous decision, which makes cultural, historical, and financial sense. I was there for about an hour and a half, which included a presentation from 4 council staff to the council, and then a council debate. I think I saw 5 or 6 of the councillors speak before I left, and got the decision via twitter (though it was clear which direction the vote was heading). 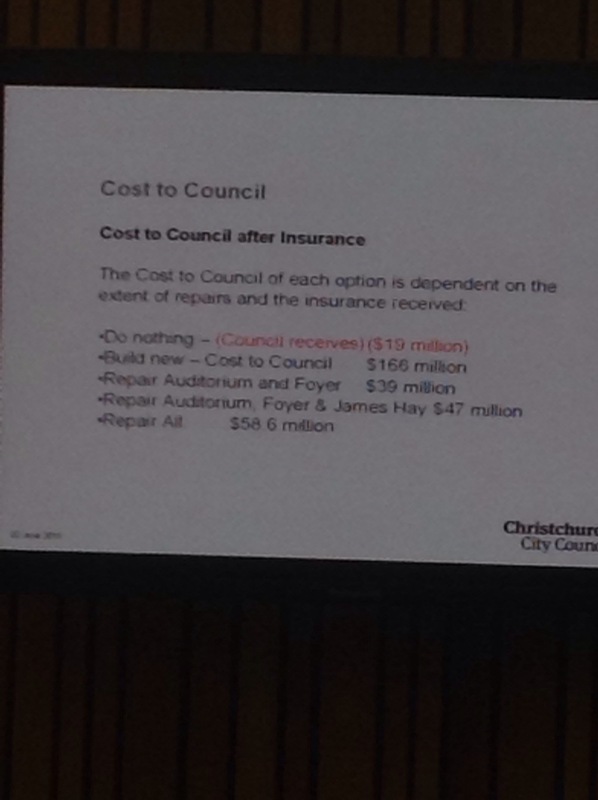 The costs to the council of the various options are outlined. As you can see, the most expensive option for the council is actually to knock down, and build new. The two partial options still cost more than half of the full resotration, but only provide the city with half of the facilities. Yet, if you have been following this story via the Press, which is the place where most people get their Christchurch news, you wouldn’t have seen that. I wrote about this on Monday, but I think it needs to be said again; their coverage has been very unbalanced, and I can only assume there was a deep lying resentment for the building. They implied that full restoration of the Town Hall was financially irresponsible, when in fact, the scenarios they endorsed were actually more irresponsible. I had a conversation with my grandmother on Tuesday night, in which she repeated the points made by the Press editorial. I took her through the numbers, after which she agreed that it did make sense. But so many more people will have just taken the paper’s word for it, and I think that is a real shame. This isn’t just a one-man conspiracy theory; the Mayor herself made it clear that she was disappointed in the reporting of the numbers contained in the report. She said that there was a perception in the media that restoring the Town Hall was the most expensive option, when in fact it was the cheapest. This was the first time I’d been to see the council in action this term, and I was very impressed with the way that she ran things. She clearly understood the issues at hand, and asked a series of very detailed questions of the council staff who presented. She made a number of points which hadn’t made it into the wider public discussion about the building. She was keen to point out that the greenest building was one that was repaired, rather than one that was knocked down and sent to landfill – a sentiment I wish the government had embraced. She also questioned how the cost-sharing agreement had budgeted a figure of $150m to build a 1500 and a 600 seat auditorium, as well as a replacement for the Court Theatre and the Symphony Orchestra, when another report showed that it would cost $190m just to build a 1500 seat auditorium. The speeches in the debate from the councillors which I saw were very good. Andrew Turner said this was a pivotal decision for the city – and I think he’s right. It’s the Council saying “hang on – this is our city, and we’ll make informed decisions about how to best administer it”. It was quite emotional hearing Jimmy Chen talk about his citizenship ceremony in the Town Hall in ’99, and also seeing his daughter perform there as part of a schools music competition. Glenn Livingstone said that he’d had plenty of emails from people, all in support. But the only dissenting voice he’d seen was from someone who hadn’t actually read the report – a not-too-subtle dig at the recovery Minister. Jamie Gough said that his gut couldn’t let him vote for this, and he didn’t feel it in his “heart of hearts” – but maybe he should stop listening to those organs, and use his brain when making decisions.